John Hathaway explains why he's been absent from the Octagon for so long on UFC World. On this week’s UFC World podcast, John Hathaway discusses his return to the Octagon after 17 months away, when he will headline against Dong Hyun Kim, on the China Ultimate Fighter finale, in Macau, China, on March 1. Hathaway insists the time on the sidelines has not been wasted. 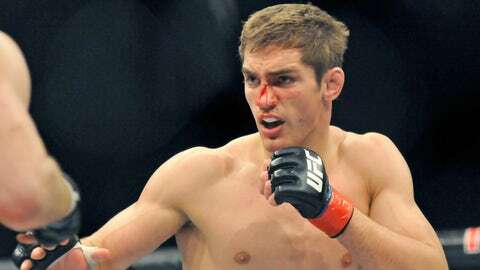 He has learnt about his body, honed his skills, and expresses excitement at the state of the welterweight division, since he last fought, incredibly, at UFC on Fuel TV 5, in Nottingham. He discusses the retirement of Georges St Pierre, and how he sees Johny Hendricks vs. Robbie Lawler for the vacant title. Then, I talk to Zuffa Head of Content Marshall Zelaznik who explains the complexities of broadcast rights globally when it comes to the new UFC digital network, which Zelaznik believes will win over the fans. Zalznik admits that it is complex, but that the UFC will listen to the fans. Women’s bantamweight fighter Cat Zingano discusses her year in 2014, the patience needed in her life and her assertion that she thrives on adversity, and middleweight Lorenz Larkin – who has a career victory over Robbie Lawler at middleweight in Strikeforce – joins the UFC World Podcast ahead of his fight in Duluth, Georgia against Brad Tavares.